jobby: Jam Filled Job Fair! Toronto! Wednesday, September 19th! 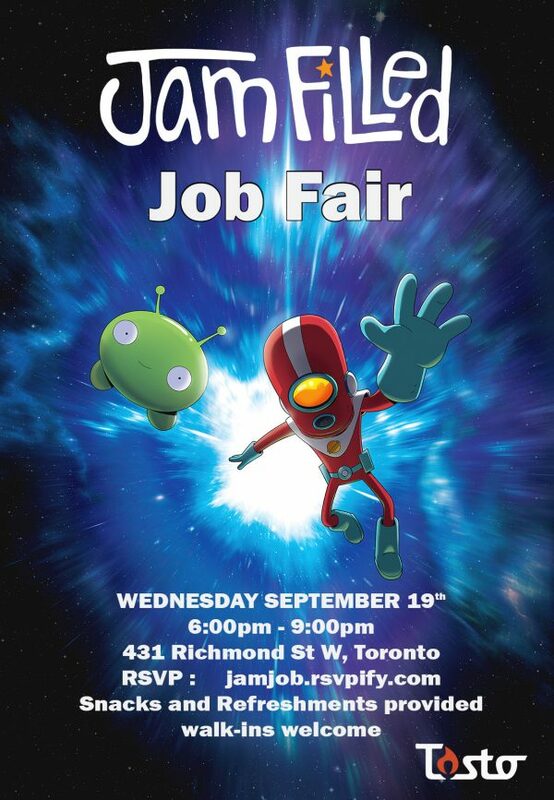 Jam Filled Toronto is doing the job fair thing this week. They’re opening their doors of Wednesday, September 19th at 6pm. I’m told they’ll be doing a bit of a studio overview and outlook for the future at the event, with a focus on Final Space starting up this fall, a second 2D pipeline rolling out in the spring and additional CG work in both Ottawa and Toronto also coming down the pipe early next year. Lots going on, so if you’re even just curious about life at Jam Filled, this is a cool opportunity to find out more. This entry was posted on Monday, September 17th, 2018 at 2:46 pm	and is filed under Jobs. You can follow any responses to this entry through the RSS 2.0 feed. They’ve been pretty aggressive calling people directly as well. At least three people I know have been contacted and got the hard sell to leave their studios. Pretty much a “what will it take to leave” offers. Advice to people if you take them up on it, get as much as you can!